February 2014 – The Malish Corporation, a global leader in the manufacturing of rotary brushes and accessories, announced today the addition of a new removal hand tool to its Diamabrush By Malish™ Floor Preparation System line of products. Available in 4.5″ and 7″ sizes, the Diamabrush By Malish™ Removal Tool is easy to use with existing hand grinders and uses the same diamond abrasive technology characteristic of the entire Diamabrush By Malish™ line. This feature helps prevent caramelizing or clogging of the tool, resulting in fast and effective removal through the life of the tool. 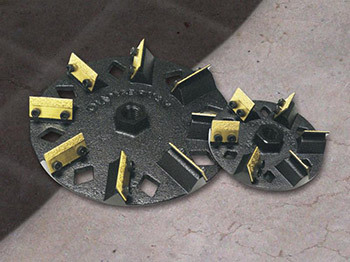 In addition to prepping concrete floors, the tool can also be used on walls made of brick, block, stone, and metal. Because the patented design of the hand tool uses a mechanical removal solution, like all Diamabrush By Malish™ products, it is completely chemical-free. To learn more about the Diamabrush By Malish™ family of products, visit www.diamabrushbymalish.com.